So, here's the nitty gritty. 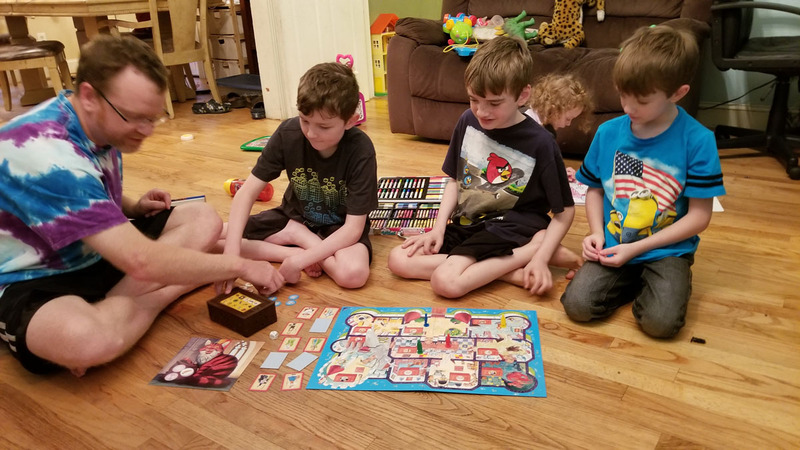 The box says that the game is for ages seven and up, though Silas (my six year old) has had no problem whatsoever playing it. The basic premise of the game is that an evil wizard is coming to attack the kingdom, and he has enspelled one of the king's servants to steal the magic ring that the king would use to stop the invasion. The castle animals witnessed the theft, but only children can speak with them to learn the thief's identity. You have a limited amount of time to search the castle and speak with the animals to identify the thief. Memory, logic, and teamwork are all put to the test while playing this board game. 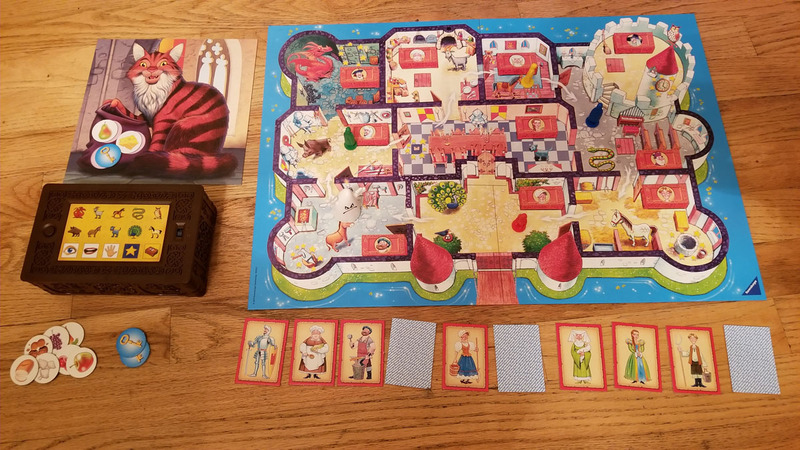 The game combines a traditional game board of the castle layout with an electronic chest. The chest has buttons for each room of the castle, as well as for various actions - a player can search a given room, speak to the animal in that room (and feed it, if possible, to gain a clue from it), use magic (if available in the room), or check the chest of that room's occupant (if a key is owned). Searches turn up keys and various food items, and each game plays out differently (i.e. the thief changes from game to game, the locations of the hidden foods and keys also change). Here's what the game looks like when set up. There is a ghost that haunts the castle, and if the players run into the ghost, they must return to the original room. There is also a good fairy that will appear at random times and offer aid to the players (typically in the form of an extra turn). All games are completely cooperative in nature - you either find the identity of the thief as a team, or time runs out and the evil wizard wins (and everyone loses). Teamwork is vital, as players must share resources, work together to coordinate searches, decide how to best interpret clues - "The thief was tall"... okay, does that rule out the stable boy? What about the blacksmith? Does the goat consider the princess to be tall? 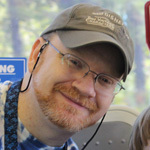 The game is designed for two to four players, though you could easily toss a Monopoly token or two on the board and play with more, if you so desired. Note that games take a solid half hour or so to complete. 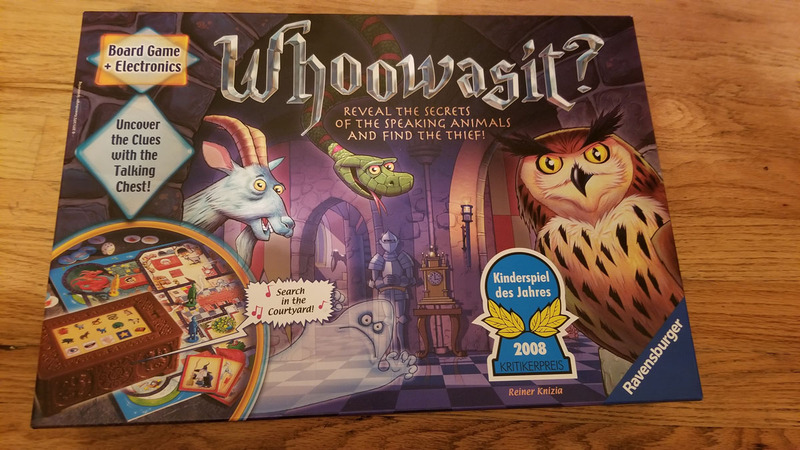 The instructions are a little bit vague - but they correctly point out that pretty much every question you may have will be answered by simply playing the game (the talking chest makes things abundantly clear on a turn to turn basis). So, what's the verdict? 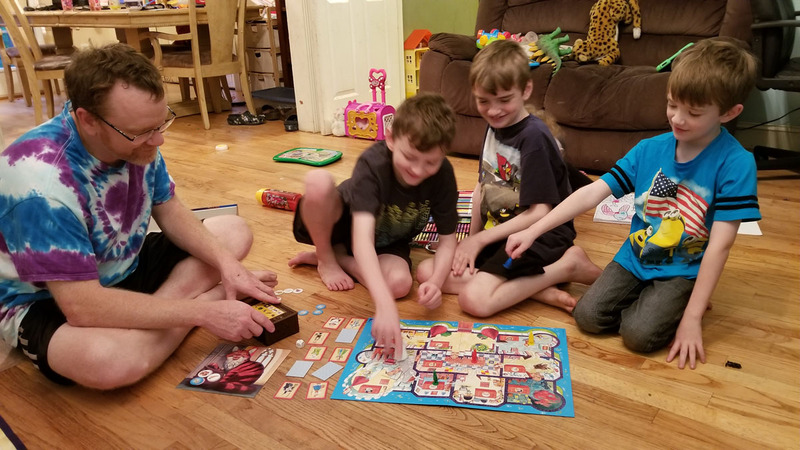 As stated above - my boys have had a blast every time that we have played this game, and they tend to talk about it afterward. The voice acting is a lot of fun - the ghost is a particular favorite of my kids, though they enjoy some of the clue combinations, too. I would be remiss if I didn't point out how beautiful the artwork is, but the game is more than window dressing. The random nature means that there is so much replay value, and the pacing is so well done - every game feels like a race against the clock. In fact, our Sunday match ended with us discovering the identity of the thief - on a nigh desperation 50/50 guess - with the final "game time" registering as 5:50 PM and the wizard due to arrive at 6:00 PM on the dot. If you are looking for a quality, fun way to spend some time with your children, you could do far, far worse than Whoowasit. No video games here - this is quality time with the kids.